VASER Shape uses a combination of ultrasonic therapy and massage to smooth, firm, and shape the body by temporarily reducing the appearance of cellulite. The procedure targets your problem areas. VASER Shape can help your body's metabolism by increasing blood circulation in the area being treated, and it can also reduce the pain and swelling that occurs after liposuction and other surgical procedures. The right curves and contours can turn heads and raise eyebrows. Unfortunately, many of us also have cellulite — those extra dimples when we wear our short shorts, for instance. Thanks to VASER Shape, there's a non-surgical solution to smooth and shape your body. By temporarily reducing the appearance of cellulite, each VASER Shape treatment gets you closer to the smooth body you want. Lumpy, uneven cellulite is normal fat tissue that has started to protrude between the connective tissue under the skin. It is commonly found on the legs, buttocks, or arms, and is much more common in women than in men. In women, the connective structure under the skin is parallel, leaving room for fat tissue to push upward and create an uneven appearance to the skin. For men, these structures are crossed, no parallel, so fat tissue is less likely to begin to protrude. VASER Shape helps to drain excess fluid and massage the tissue into place, temporarily reducing the appearance of cellulite. VASER Shape uses a combination of massage and ultrasound energy to help fat tissue release excess fluids and contents which are then removed naturally by the body’s lymphatic system. The warming ultrasound energy causes the fat cells to release their contents, while the massage helps open up the lymphatic system and move the released contents away from the cells to be purged by the body. What can I expect during my VASER Shape treatment? The treatment begins with a lymphatic massage. The massage is followed by the ultrasound treatment, which begins the process of releasing fluids and fats. The treatment concludes with a final lymphatic massage. The treatment has no pain, and is often described as relaxing and spa-like. Depending on the size of the area, the treatment usually takes about 45 minutes to an hour per body area. As there is no pain or downtime, clients can immediately return to their normal activities following a VASER Shape treatment. What results does VASER Shape create? VASER Shape both helps reduce circumference in the treated areas, it also helps reduce the appearance of cellulite. A full course of treatments can result in dramatic changes. There is no prescribed diet or supplement for the improvements from VASER Shape. However, as with any body contouring treatment, a healthy lifestyle will help your results last as longer. For cosmetic surgery patients, VASER Shape is also an effective way to reduce pain and swelling while promoting circulation and a faster recovery. For clients looking to achieve overall weight loss, we recommend our Weight and Wellness program Amerefit. Many clients have been pleased with the results they have achieved by combining Amerefit’s personalized weight loss services with body contouring treatments such as VASER Shape. The exact number of treatments depends on your goals and specific profile. For most patients, we recommend 3 - 5 weekly sessions. Each successive session will improve your results. We encourage all clients to have a free consultation to determine the best options for their treatment. Schedule a free consultation by calling (713) 960-6262. Where can I get VASER Shape? 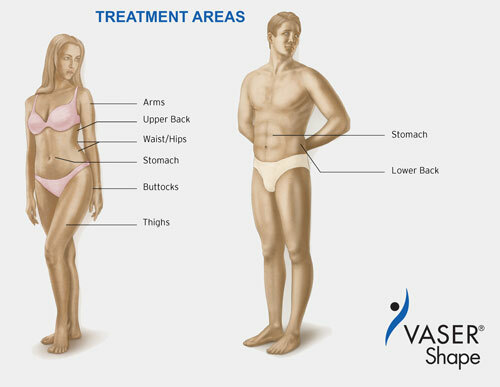 VASER Shape is a versatile treatment that can be used to treat almost any area of the body. Popular areas for women include the arms, back, waist, stomach, thighs and buttocks. Popular areas for men include the stomach or lower back. How is VASER Shape different from other Body Contouring treatments? VASER Shape uses ultrasound and heated massage to flatten and shrink the treated fat tissue. Other body contouring treatments use other types of energy to address the size, amount, or appearance of fat tissue below the skin. VASER Shape is considered one of the most comfortable of our body contouring treatments, and it has been described as feeling like a hot stone massage. Many clients find it relaxing, and the treatment has no pain or downtime of any kind. This treatment also provides immediate results that improve over the course of treatment. Other body contouring treatments may have a longer wait time before the patient begins to see results. How do I know of VASER Shape is the best choice for me? We offer free consultations so we can discuss your goals and evaluate the area to be treated. Based on this face-to-face analysis, we can develop a personalized plan for you. Some clients will find that VASER Shape fully addresses their concerns. For others, a combination of different types of treatment may be the best solution for achieving their goals. Schedule a consultation by calling (713) 960-6262. Yes, we have a number of financing options available. For more information, please visit our Pricing and Financing page. Why should I choose Amerejuve for my VASER Shape treatment? Amerejuve is Houston’s #1 MedSpa with 7 locations in the greater Houston area, making it easy to have your treatments close to home or work. We also offer a wide variety of treatments, ensuring that we can offer the best options to meet your specific goals. Our professional staff is also highly trained and prioritizes customer service.